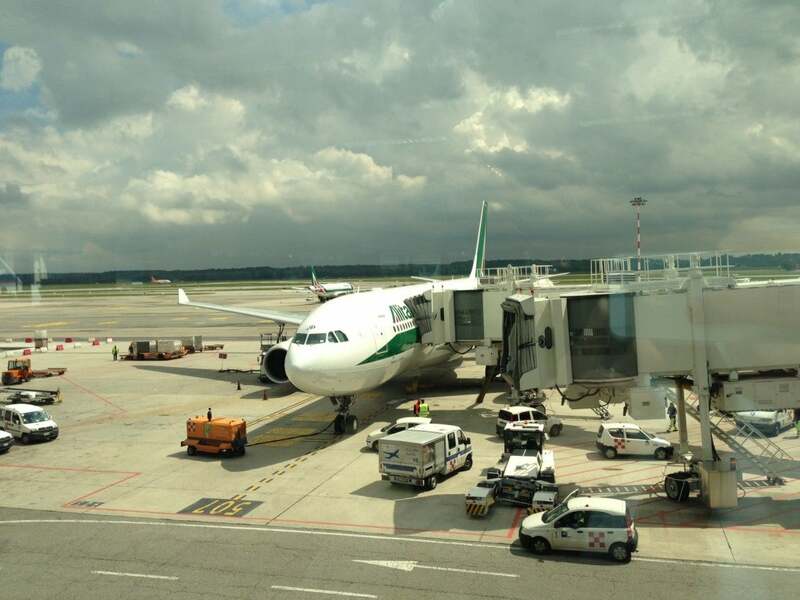 To top off an incredible weekend in Italy with some great friends where I went to Florence and then Milan to see Beyonce, we got to fly back to the states in Alitalia’s new Magnifica Business class product aboard the airline’s A330-200. I’ve been eager to get on one of these flights since I was able to experience the old business class on their 777 back in October of 2011 on a flight from Rome to Miami. My expectations were far exceeded on that flight since the crew was so nice, the food was good, the service was great and the seats were pretty comfortable so I was excited to see what was in store for this trip with a much newer seat. The new Magnifica seats are much more comfortable and stretch out farther than the old seats (on left). This flight was the return portion of the award I had booked to get to Milan using Delta miles. Although the award I originally booked a low-level award for just 100,000 miles total to fly Delta BusinessElite via Madrid and then Alitalia back, I noticed the day before departure that space had opened up on the non-stop JFK-MXP Delta flight, so I switched our tickets to that instead and spent an extra 50,000 per ticket for mid-level availability, which allowed us to better maximize our time on the ground in Italy and avoid a layover. 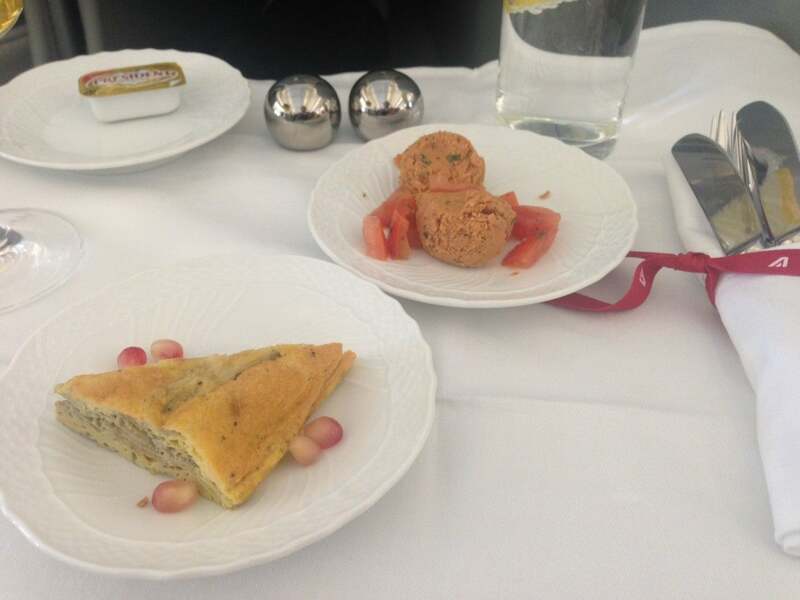 In total I had redeemed 150,000 SkyMiles for my ticket and paid about $50, flying business class both ways. Although it wasn’t the lowest level award, I felt the convenience factor was worth it, and since the face value of my ticket would have been about $4,500, I still got a good value out of my miles. 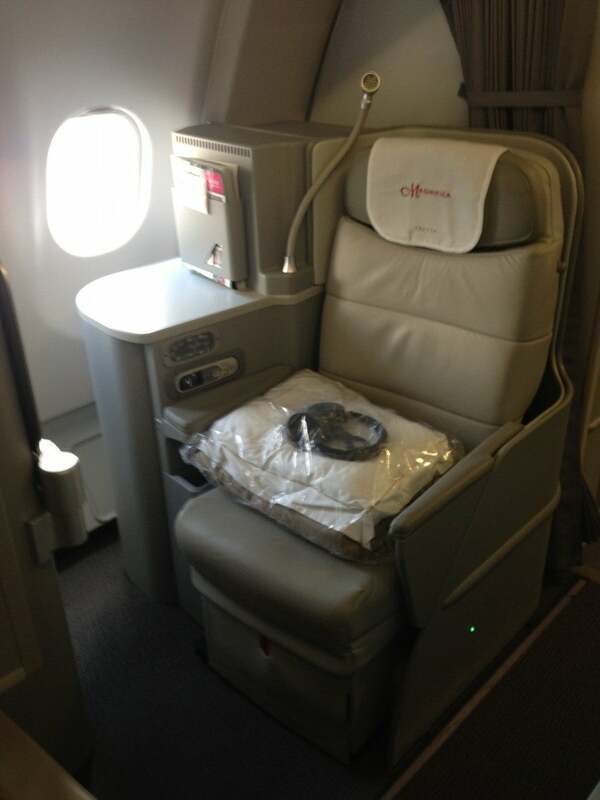 Business class is in a 1-2-1 alignment so seats on the side have much more privacy. The A330-200 has 3 classes of service, Magnifica (business) with 28 seats, Classica Plus (premium economy) with 21 seats and Classica (economy) with 181 seats. The alignment for business was a 1-2-1 which offers more privacy for those sitting in window seats, the seats together in the middle, which are often referred to as “honeymoon seats,” are nice if you’re traveling with a companion. We were in the second mini business class cabin which only has two rows and my friend sat across the aisle and I had two seats together in the middle, which was awesome since storage is somewhat limited in these seats. The seat was roomy enough for me in both the upright and lie-flat position. Magnifica class seats have 43.5 inches in pitch and are 21 inches wide. They recline to a fully horizontal lie-flat bed. The seats on the 777 that I had flown were the old-school recliner seats which I didn’t find to be uncomfortable for a day flight, but the new seats are definitely a big improvement. These lie-flat seats were great and I could fit comfortably when laying down. 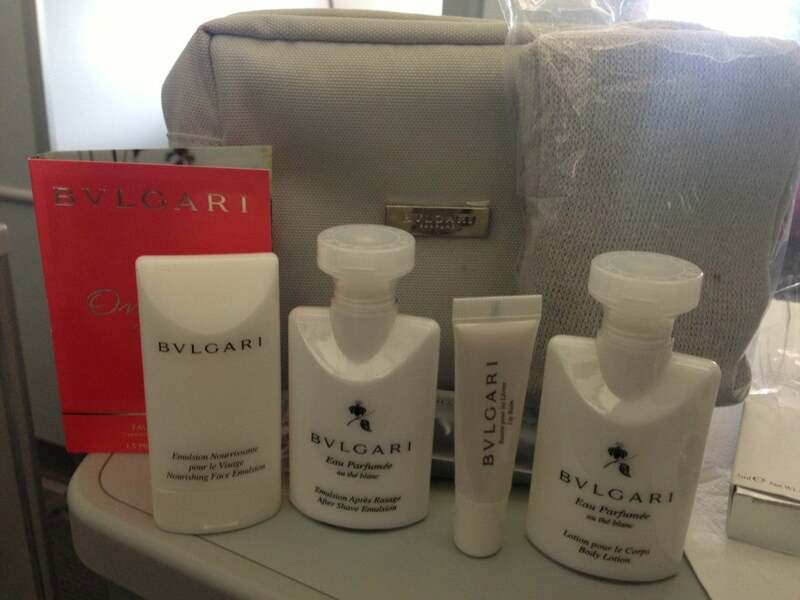 The amenity kit came with some nice Bulgari goodies like a face emulsion, after shave, lip balm, and body lotion. I always love seeing the products that come in different airlines’ amenity kits. Alitalia gave out a nice Bulgari cosmetic case that came with a nourishing face emulsion, after shave emulsion, lip balm, body lotion, and socks. 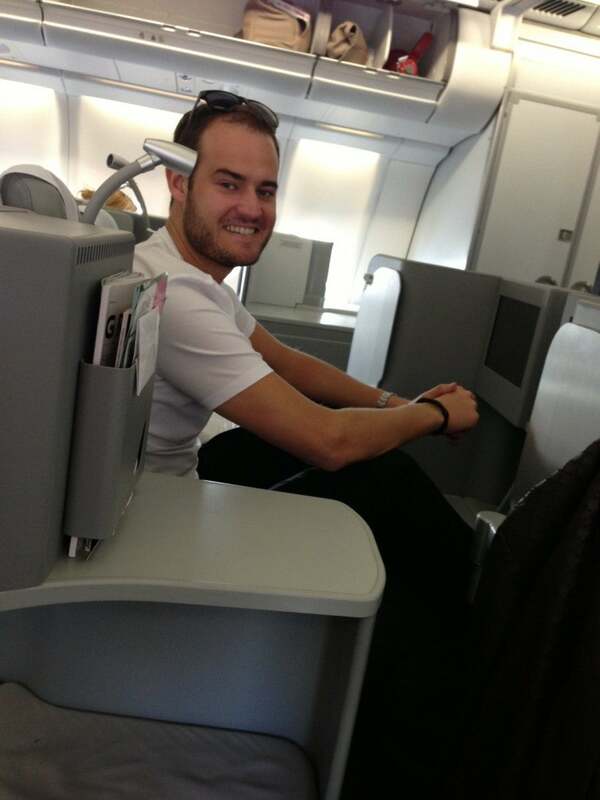 Each seat also had a 15.4-inch inflight entertainment system with a bunch of music, TV, game and movie selections. Before stretching out in my lie-flat seat I wanted to enjoy a good meal. Lunch consisted of four courses with the option for a snack as well. 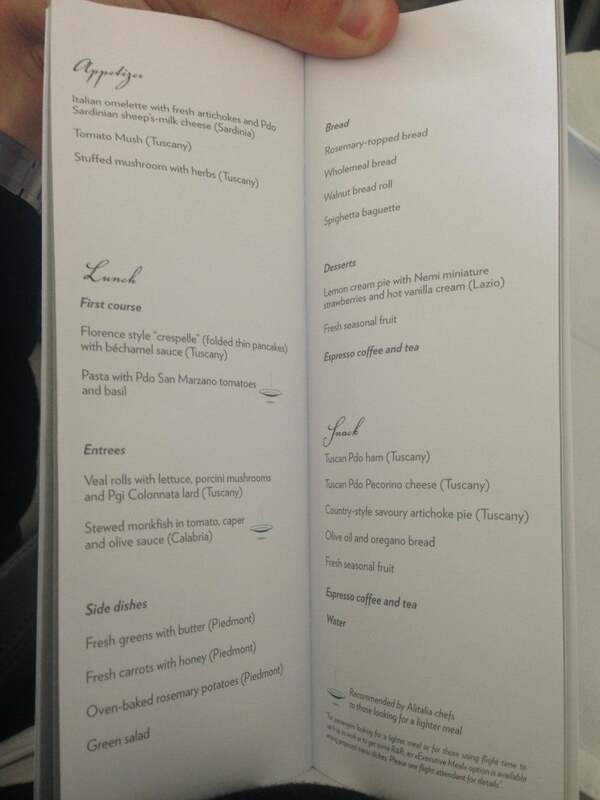 In the past when I flew Alitalia business class, I thought the food was decent, though some courses were much better than others. 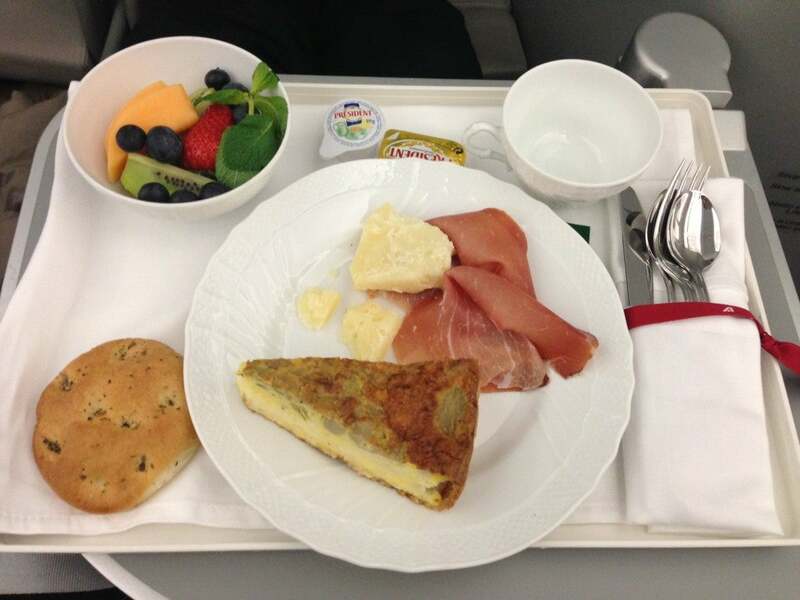 Alitalia serves meals from carts where you can pick whatever you want to eat. 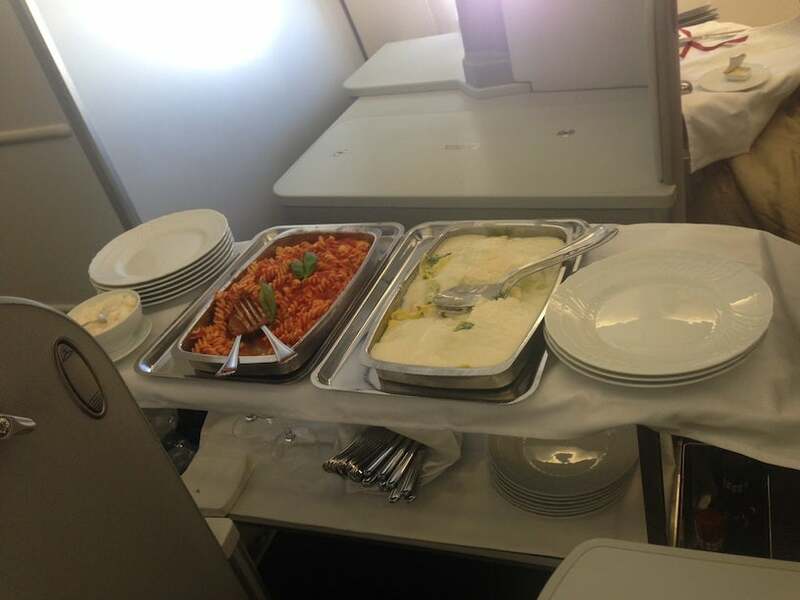 Alitalia’s flight attendants serve the meals from carts where you can pick what you want. To kick off my meal I started with the Tuscan Tomato Mush. It doesn’t have the most appetizing name or appearance but it was a light way to start the meal, though it didn’t have a ton of flavor (they actually included the recipe in the menu booklet). For an appetizer I had the Tomato Mush and Italian omelette. I also tried the Italian omelette with fresh artichokes and Sardinian sheep’s-milk cheese which was decent, though not exactly thrilling. Fusilli with San Marzano tomatoes and basil. For my first course I ordered the pasta with San Marzano tomatoes and basil. While it wasn’t nearly as delicious as some of the pasta I had when I was in Italy, I thought it was good for airplane standards. I also tried the creamy pasta – crespelle with Bechamel sauce – which was so rich I couldn’t actually taste anything but pure fat. I passed on that to enjoy my calories elsewhere! Veal rolls with lettuce, porcini mushrooms and Colonnata lard. I got to try a little of each entree, the first being Veal rolls with lettuce, porcini mushrooms and Colonnata lard, and the second was stewed monkfish in tomato, caper and olive sauce. 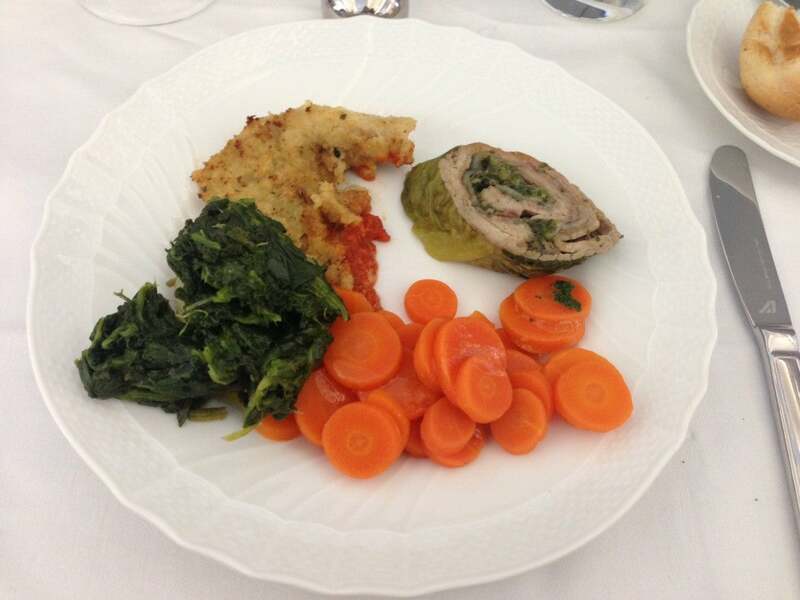 Both were very tasty but I preferred the monkfish since the veal was a little dry and heavy for my taste. Rosemary bread, bowl of fresh fruit and a snack plate of ham, pecorino cheese, and artichoke pie. About 90 minutes before arrival at JFK they served the snack option of ham, Pecorino reggiano cheese and country-style artichoke and a bowl of seasonal fruit. 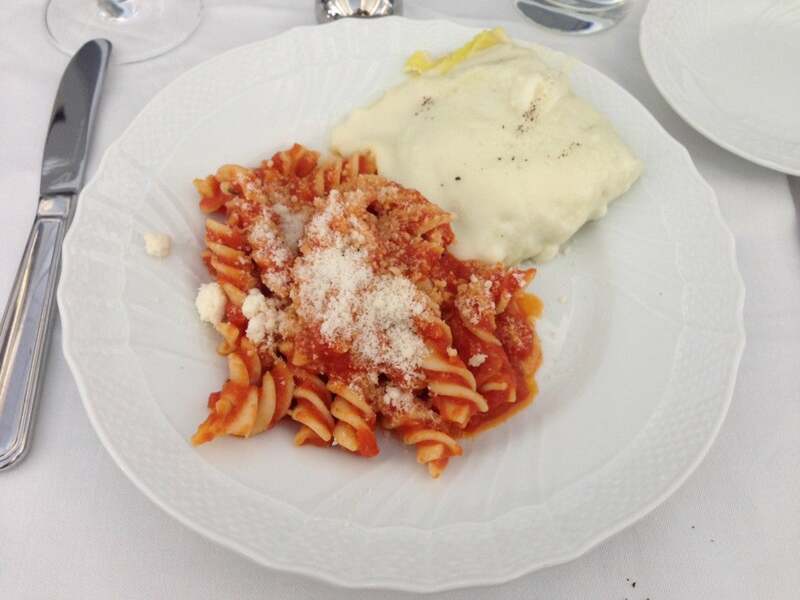 To be honest, this was my favorite course- I can’t get enough fresh Italian cheese! I was sad to leave Italy but at least we got to ride in style! The bed was really comfortable with a light duvet and good-sized pillow all in upscale Frette linens , which was a nice touch. After such a busy weekend running around Italy and trying to see as much as we could in our short time, flying home in Alitalia’s enhanced business class was a treat and I would definitely fly it again in the future- especially since Alitalia awards always price out at the low-level using Delta and all of the Delta agents I spoke with had no issues booking these flights, unlike fellow SkyTeam partners Air France and KLM.